I read some posts about this book and admit to being intrigued. I also have to admit to being quite disappointed. The story premise had promise and simply fell flat. I saw the trailer for the upcoming movie release and I was intrigued. Since reading the novel usually gives you more insight into the characters, I decided to grab a copy, drop my TBR list and not wait until the movie comes out. From what I can see from the trailer compared to what I read, I would suggest saving your $11 for the movie ticket. Stunning, exciting and slightly gross but definitely enjoyable. 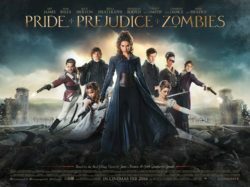 I read Pride and Prejudice and Zombies when it first came out and I wasn’t impressed but even at that time I kept thinking it would do much better visually and I was excited about the immediate rumors that it would be made into a movie. Gertrude Hunt will be hosting an intergalactic summit between three warring factions and like Caldania, I was looking forward to seeing some action. Book 2 was definitely more exciting than the first book and still an enjoyable story. This story was certainly not as exciting as a Kate Daniels novel, but it was still a very enjoyable story with its own interesting world building. The very premise of the story opens up the possibility for future stories and characters.